Navy grosgrain Goldendoodle ribbon on 1-inch-wide sturdy red nylon. $28.00 $22.40 On Sale! 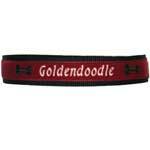 Navy grosgrain Goldendoodle ribbon on 1-¼-inch-wide sturdy red nylon. $28.00 $22.40 On Sale! Poppy red canvas with navy/green accents and navy grosgrain Goldendoodle ribbon. $28.00 $18.00 On Sale!